Another ‘Ōlelo Noe‘au notes “Puna paia ʻala i ka hala. Puna, with walls fragrant with pandanus blossoms. Puna, Hawai’i, is a place of hala and lehua forests. One story tells that Hāʻena, a small bay near the northern boundary of Puna, is said to be the birthplace of hula. The goddess Hiʻiaka is said to have been instructed to dance hula on the beach there. Initially founded in 1899 as Olaʻa Sugar Company, it was later (1960) renamed Puna Sugar Company. The coffee trees were uprooted to make way for sugarcane. ʻŌhiʻa forests also had to be cleared, field rock piled, land plowed by mules or dug up by hand with a pick. Sugarcane was in large-scale production; the sugar mill operation ran for just over 80 years, until 1984. Another thing growing in Puna is housing. Between 1958 and 1973, more than 52,500-individual lots were created – at least 40-substandard Puna subdivisions were created. There is a disturbance in the forest. The native Hawaiian ʻōhiʻa (Metrosideros polymorpha) is the most abundant tree in the Hawaiian Islands, comprising about 62 percent of the total forest area. ‘Ōhi‘a lehua is typically the dominant tree where it grows. Although the species is little used commercially, it is invaluable from the standpoint of watershed protection, esthetics, and as the only or major habitat for several species of forest birds, some of which are currently listed as threatened or endangered. ʻŌhiʻa is a slow-growing, endemic evergreen species capable of reaching 75- to 90-feet in height and about 3-feet in diameter. It is highly variable in form, however, and on exposed ridges, shallow soils, or poorly drained sites it may grow as a small erect or prostrate shrub. Its trunk may range in form from straight to twisted and crooked. Because the species can germinate on the trunks of tree ferns and put out numerous roots that reach the ground, it may also have a lower trunk consisting of compact, stilt-like roots. The hard, dark reddish wood of ʻōhiʻa lehua was used in house and canoe construction and in making images (ki‘i), poi boards, weapons, tool handles, kapa beaters (especially the rounded hohoa beater), and as superior quality firewood. ʻŌhiʻa lehua, though of a very nice color, cracks or ‘checks’ too easily to be useful for calabash making. The foliage served religious purposes and young leaf buds were used medicinally. The flowers and leaf buds (liko lehua) were used in making lei. To Hawaiians of old, the gods were everywhere, not only as intangible presences but also in their myriad transformation forms (kinolau) and in sacred images (ki‘i). Most of the large images were carved from wood of the ʻōhiʻa lehua, an endemic species that is regarded as a kinolau of the gods Kane and Kū. The materials used in large part depended on the resources available nearby and whether a hale was for aliʻi or makaʻāinana, but in either case, hardwoods were selected for the ridgepoles, posts, rafters, and thatching poles. Hardwoods grew abundantly in Hawaiian forests, in terms of both number of species and the count of hardwoods as a whole. ʻŌhiʻa lehua grew on all the major islands and was widely used in housebuilding. Canoe decking, spreaders, and seats were commonly made of ʻōhiʻa lehua, as well as for the gunwales. ʻŌhiʻa lehua was one of the five primary plants represented at the hula altar (ʻōhiʻa lehua, halapepe, ‘ie‘ie, maile and palapalai.) The hālau hula, a structure consecrated to the goddess Laka, was reserved for use by dancers and trainees and held a vital place in the life of an ahupua‘a. Inside a hālau hula was an altar (kuahu), on which lay a block of wood of the endemic lama, a tree whose name translates as “light” or “lamp” and carried the figurative meaning of “enlightenment.” Swathed in yellow kapa and scented with ‘olena, this piece of wood represented Laka, goddess of hula, sister and wife of Lono. … halapepe (Pleomele aurea) for the goddess Kapo; ‘ie‘ie for the demigoddess Lauka‘ie‘ie; maile representirig the four Maile sisters, legendary sponsors of hula; and palapalai fern, symbolic of Hi‘iaka, sister of the volcano goddess Pele and the benefactor of all hula dancers. Native Hawaiians consider the tree and its forests as sacred to Pele, the volcano goddess, and to Laka, the goddess of hula. ʻŌhiʻa lehua blossoms, buds and leaves were important elements in lei of both wili and haku types. ʻŌhiʻa is the first tree species to establish on most new lava flows. As the entire portion of eastern Hawaii Island is a volcanic area, lava flows occasionally cover areas of forested land. Thus, while some forests are covered with lava, other forested areas serve as ‘seed banks’ and help to bring growth back life to the lava-impacted area. There is a disturbance in the forest. Rapid ʻŌhiʻa Death is posing the greatest threat to Hawai‘i’s native forests. A newly identified disease has killed large numbers of mature ʻōhiʻa trees in forests and residential areas of the Puna, Hilo and Kona Districts of Hawaiʻi Island. Pathogenicity tests conducted by the USDA Agriculture Research Service have determined that the causal agent of the disease is the vascular wilt fungus; although a different strain, this fungus has been in Hawaiʻi as a pathogen of sweet potato for decades. It is not yet known whether this widespread occurrence of ʻōhiʻa mortality results from an introduction of an exotic strain of the fungus or whether this constitutes a new host of an existing strain. This disease has the potential to kill ʻōhiʻa trees statewide. The disease affects non-contiguous forest stands ranging from 1 to 100 acres. As of 2014, approximately 6,000 acres from Kalapana to Hilo on Hawaiʻi Island had been affected with stand showing greater than 50% mortality. The disease has not yet been reported on any of the other Hawaiian Islands. Crowns of affected trees turn yellowish and subsequently brown within days to weeks; dead leaves typically remain on branches for some time. On occasion, leaves of single branches or limbs of trees turn brown before the rest of the crown of becomes brown. The fungus manifests itself as dark, nearly black, staining in the sapwood along the outer margin of trunks of affected trees. The stain is often radially distributed through the wood. UH scientists are working to protect and preserve this keystone tree in Hawaiʻi’s native forest. The Seed Conservation Laboratory at UH Mānoa’s Lyon Arboretum launched a campaign to collect and bank ʻōhiʻa seeds. They will collect and preserve ʻōhiʻa seeds from all islands for future forest restoration, after the threat of Rapid ʻŌhiʻa Death has passed. While small gravity and mule-powered rails popped up here and there in the eastern United States, it was the coming of the steam locomotive that truly allowed railroads to prosper. In August 1829, Horatio Allen tested an English-built steamer named the Stourbridge Lion in Pennsylvania; by the time of the Civil War there were more than 60,000 miles of railroad in the country, by the 1870s, the Transcontinental Railroad stretched all the way to California and there were more than 190,000 –miles of rail at the beginning of the 20th century. During the height of the industry, commonly referred to as the ‘Golden Age’ from the late 19th century through the 1920s there were more than 254,000 miles of railroad in service. The expanding rail system needed material to tie the rails – then, in 1907, the ‘Santa Fe’ came to the Islands. The Atchison, Topeka and Santa Fe Railway Company (distinctively known as the Santa Fe) was founded by Cyrus K Holiday in Kansas in 1859. A line that reached from Kansas to California and from Kansas to the Gulf of Mexico was the vision of Holiday. Hawaiian Mahogany Lumber Company (also called Pāhoa Lumber Mill) began in 1907 (owned by James B Castle.) By September 1908, the company was operating a lumber mill in Pāhoa. A narrow gauge railroad was built from Glenwood to the saw-mill in the woods back of the Volcano House, the mill itself has been erected and some of the machinery installed. Trees were felled in the forest, cut into logs and hauled in to the mill yard. Most of the ties were to be cut in the Puna District on the homestead lots above Olaʻa, on lands of the Puna Plantation that were being cleared for cane, and on other lands in Puna on which rubber will be planted. The ties will be shipped from Hilo by steamers and sailing vessels, the first shipment being sometime in the spring of 1908. 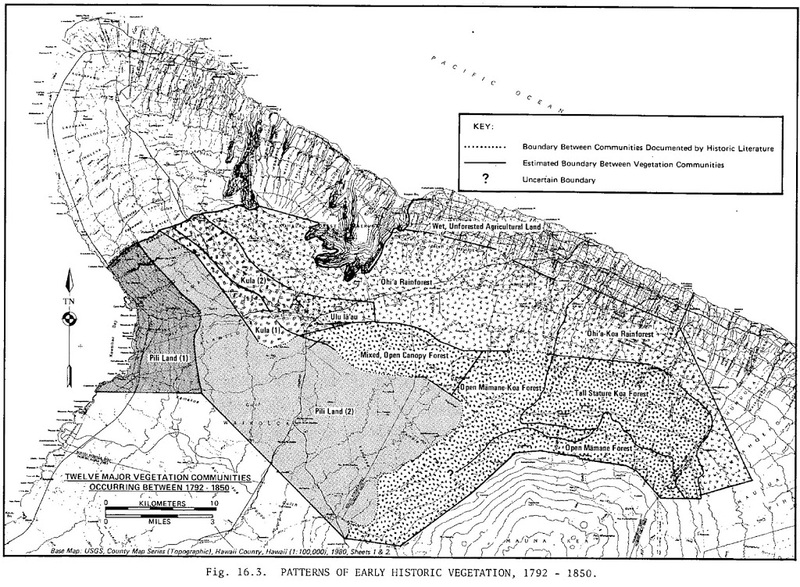 In January 5, 1910 Lorrin A Thruston and Frank B. McStocker of the Hawaiian Development Co. Ltd. appeared before Marston Campbell, Commissioner of Public Lands in Honolulu, to secure rights to log a tract of government lands in Puna. The contract with the Santa Fe Railway System was never fulfilled. The Division of Forestry noted that by 1914, few ‘ʻōhiʻa was being sold for railroad ties after it was realized that the ‘ʻōhiʻa wood ties did not last in the extreme conditions of the southwest.